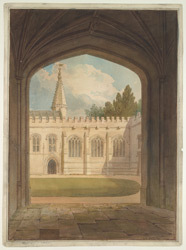 This watercolour is a view through to the quadrangle at Balliol College, Oxford. The college has the largest facade of all the university buildings in the city. Its irregular plan, aided by gradual additions over time, does not justify its internal space being called a "quad". The college was founded by John Balliol, loyal lord to the court of Henry III. Advised by the Bishop of Durham, Balliol promised to support the payment of sixteen young scholars in Oxford. In 1282 the newly formed college was awarded a charter by John Balliol's devoted widow, Dervorguilla of Galloway, who embalmed her beloved's heart in a silver and ivory casket.